The cozy garden area of the newly opened Pie Sabai Bistro. A new place to go just opened in town on Sunday, September 4, no longer a secret hideaway for those lovers of Audrey Dootson’s breads and cakes, also known as Mrs. Pie Sabai. The Pie Sabai Bistro is next door to her garden restaurant near Wat Umong, and is as tasteful and comfortable as her well-known garden cafe. 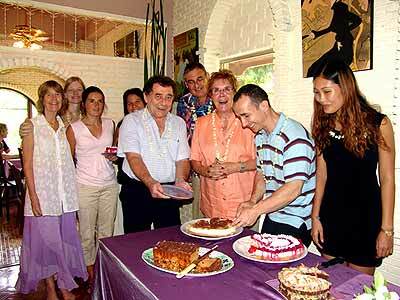 In addition, three chic private rooms will cater for small family gatherings or parties. Opening day Sunday Brunch was prepared by French Chef Jean-Claude and his wife Fung, who previously took care of a couple of restaurants in Vietnam. Salmon pโt้; garden fresh salads; homemade potato salad; chunks of chicken and more. The opening day was an invitation to indulge and we all did. The bistro will be open daily, except Mondays, from 11 a.m. - 10 p.m. with a daily changing menu and Sunday brunches, all with seasonal ingredients. Out came the cakes: raspberry cheesecake, pear cr่me cake, chocolate, you name it. Amongst friends and guests are (from right) Fung, Jean Claude, Audrey and Jeremy Doodsen and the first piece went to Basil McCall who just could not resist. Almost 50 film lovers enjoyed ‘Thriller Night’. The first film shown and discussed was 70 minutes long, written, directed, and produced by Don Mott and his friend, Kot. Don teaches English at Chiang Mai University and gave his students a way of expressing themselves by exercising their English and drama skills. The thriller called “Roomies” was very well done from a technical standpoint - the camera work, the selection of venues, the sound and even the pronunciation had only a tinge of an accent. Local film maker Renee Weygandt (second from right) brought a group of friends along. The second film was a documentary by Mr. Neville, who works with a United Nations program in the drug field. A short story, but well done. The films were followed by a pot luck dinner with about four times the amount that could be consumed. A nice touch afterwards, was that the food that was not eaten was gathered up and taken to the night bazaar where many Burmese workers appreciate the thoughtfulness. Michael Ginor is known for bringing together celebrated American and local chefs to create an intercultural culinary exchange program which introduces global concepts and ideas to the world market. After the great success of 2004, the Four Seasons Resort Chiang Mai will again present a unique opportunity to look over the shoulder of world-renowned master chefs as they take to the stoves at the Cooking School on Sunday, 18 September from 6 - 8 p.m.
Fresh from the World Gourmet Festival at in Bangkok, the confirmed line-up of chefs who will join the cook-off that evening includes Walter Manzke, and Margarita Manzke, who opened a small, intimate restaurant L’Auberge Carmel which has been selected as one of the world’s best new dining destinations by the editors of Robb Report in the June 2005 issue and Bon Appetit Magazine featured L’Auberge in their ‘Best of the Year’ January 2005 issue, calling Manzke ‘at the top of his game’. Another is Michael Ginor from Hudson Valley Foie Gras, New York who joins the World Gourmet Festival for a record 6th time. Michael established what is the major Foie Gras producer in the world today. Cyrus Todiwala from the Caf้ Spice Namast้, London UK is proprietor and Executive Chef of the Caf้ Spice Namast้ restaurant group, renowned for its innovative and fresh approach to Indian cuisine. Caf้ Spice Namast้ is the only Indian restaurant in the UK to be awarded the Investors in People Standard and a National Training Award as well as being runners up for the Millennium Excellence Awards. He has been voted Best Indian Chef in the UK, awarded a Culinary Honor of Merit Award from the World Chef Society and Caf้ Spice Namast้ is one of the only Indian Restaurants to win the BIB Gourmand Award from the Michelin Guide. Enrique Luis Blondet Montero, the Gastronomic Director of ‘La Rosa Nautica Restaurant’, Lima, Peru. Chef Blondet, a graduate of the Ritz Escoffier High Cuisine and Pastry School in Paris is a firm devotee of this vibrant Peruvian cuisine, a sophisticated blend of Spanish, Asian, and ancient Incan methods and flavors based on readily available seafood. Laurent Tourondel, from BLT (Bistro Laurent Tourondel) New York, USA gained vast and varied hands-on culinary experience in the best kitchens around the world. 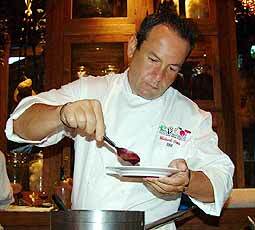 A stop at Caesar’s Palace in Las Vegas earned him the coveted Food and Wine Magazine’s Ten Best New Chefs 1998 and in 1999 The New York Times awarded him a well-deserved three-star review for Cello, the former Upper East Side restaurant devoted to inventive fish and seafood. With BLT Steak, Chef Tourondel realized a lifelong dream of opening a restaurant where steak, meat and fowl take center stage, the result being the Modern American Steakhouse. Lorenzo Vivalda from Antica Corona Reale da Renzo di Cervere, Cervere Italy comes from a restaurateur family which founded the restaurant in 1835 and achieved a Michelin star in 2003, the national award Espresso 2003 for the best and original utilized raw material and first place in the list of Provincial restaurants for 2003 and 2004. Lorenzo was named Chevalier of the Italian Republic by the Italian President. Lorenzo’s aim is to use the freshest products of his native region including snails, river fish and Piedmont Beef Fassone. It is rare to meet these chefs all under one roof in a relaxed environment. Tickets are 1000 baht per person inclusive of tax and service. Due to limited space it is highly recommend to book early at the Four Seasons Resort Chiang Mai, tel. 0 5329 8181. A Christian women’s retreat is to be held at Suan Bua Resort from Friday afternoon, Sept. 23, to Sunday noon, Sept. 25, and Chiang Mai women are invited to attend. The Chiang Mai Women’s Retreat was started ten years ago by Judy Clark, a live-wire from Prince Edward Island and the wife of Barry, former pastor of Chiang Mai Community Church. Women from different backgrounds have a great time, and this has become a popular annual event in September, involving women from churches all over Chiang Mai and beyond. The goal is to provide an enriching time of encouragement, refreshment, fellowship and Christian worship together. Speakers will come from Chiang Mai community, as they have in the recent years, and the organizers have chosen as Joan Eubank, famous for her Broadway career before coming to Thailand more than 40 years ago with her family’s ministry; Cathy Byers, whose passions include “inner healing prayer” and home schooling; and Karen Thomson, senior producer at CBN Siam as the main speakers for “Chiang Mai Women’s Retreat 2005 - Together with the Father”. Saturday afternoon events will include a Mad Hatter’s Tea party. Wearing a hat is prerequisite for entry, but millinery supplies will be available, and there is a prize for the best original creation. There will also be a popular water aerobics session with Ruth Erickson. 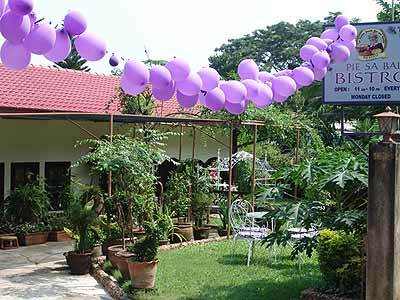 All women interested are welcome to join the weekend from September 23-25 at Suan Bua Resort. For information or registration forms contact [email protected] cmcchurch.org or local international churches.